Commerce organizations are grappling with the need to work faster, deliver sooner, and scale up and down as demand requires. SaaS commerce is appealing, but in many cases, organizations don’t want their customer data to reside in a public cloud or they don’t want to outsource their commerce infrastructure to their biggest competitor. Does this mean these organizations will lose out on the benefits of cloud? No. Now they can have the best of both worlds, the control their business requires and the speed and ease of use of SaaS. 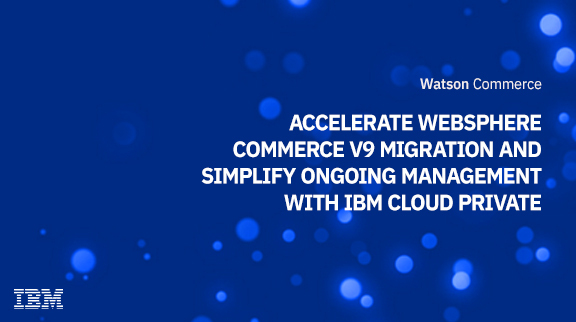 Speed migration to WebSphere Commerce V9 and start reaping the benefits of a modern commerce platform. Easily gain the skills needed to build and run your own multi-cloud commerce environment. Accelerate your commerce operations to deliver customer experience enhancements faster and reduce commerce platform TCO.